The first step to recovery is admitting you have a problem right? Well, here it is: I am a sugar addict. My cravings are seemingly innocent, a handful of chocolate covered bananas, a vegan ice cream bar, or even a couple squares of an organic dark chocolate bar. Nothing is wrong with indulging with a sweet treat once in a while, but when you’re dependent on it then you know you have a sugar addiction. The American Heart Association says the most amount of added sugars you should have in a day is 36 grams for men and 25 grams for women (not fair)*. The reality is the average American eats 82 grams of sugar a day**. I’m not surprised since sugar is hidden in so much of our food, such as condiments, sauces, breads, and yogurt. I recently learned from Sarah Wilson, author of I Quit Sugar, that the human is genetically wired to crave and binge on sugar. This is because back in the hunter and gatherer days, sugar was hard to come by and people didn’t know when their next meal would be. When sugar was eventually found, say a beehive, they would gorge on it. This would allow them to put on fat quickly and have enough energy to survive until their next meal. Today we are still wired the same but don’t need to binge on sugar for survival. Eating too much sugar may result in a bunch of health issues such as increased risk of heart disease, cancer, diabetes. It may cause wrinkles, insomnia, allergies, hair loss, and ADD/ADHD, and hormone imbalances. With all that being said, I have been trying to curb my sugar intake even if it’s less refined sugar like honey and maple syrup. Instead I am enjoying sugar from fruits and vegetables. I’ve also been eating foods that curb my sugar cravings as seen in this infographic from Positive Health Wellness. 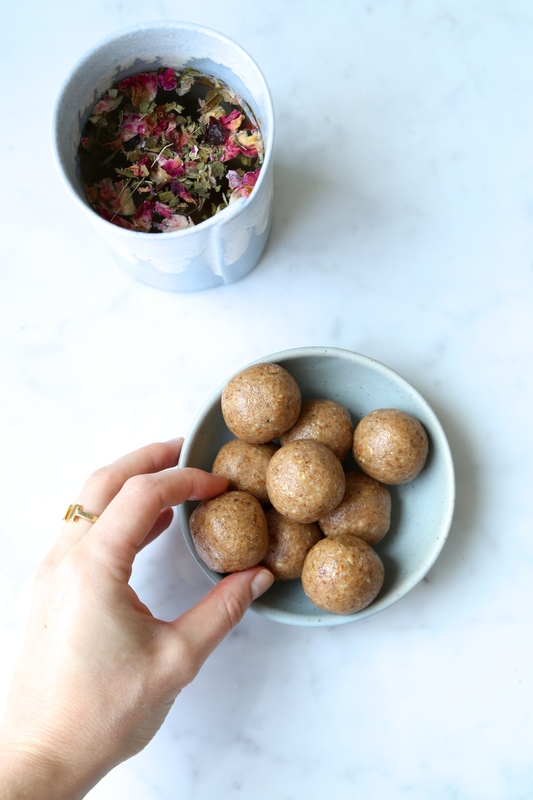 These delicious nut dough balls are my first line of defence for when I’m craving a snack that will give me energy from healthy fats and without all the sugar. Hope you enjoy them as much as I do! A low in sugar treat! Place the nuts and seeds into a food processor or high speed blender and pulse into a coarse flour. Add the remaining ingredients and pulse until well blended. Roll dough into bite size balls with your hands and place on a parchment lined baking sheet (If dough is too soft and sticky place in the fridge for half an hour). Refrigerate finished balls for about 1 hour before serving. Store the nut dough balls in an air-tight container in the fridge for about 3 weeks or for months in the freezer. This entry was posted in Snacks and tagged energy balls, gluten-free, low sugar, naturally sweetened, Vegan, Vegetarian. Bookmark the permalink.